some of you probably already know about it but if you don't and you don't like controlers, i found a converter for a keyboard a mouse for the xbox and ps2. It's called the Smart Joy FRAG, found it at lik-sang.com. Cycling through the KotOR II menus using the R & L shoulder buttons gets old. I actually own a SmartJoy Frag, but because I've let my girlfriend's little sisters borrow my Playstation 2, I haven't had a chance to play with it yet. I just tested it (in GTA: San Andreas) and it seemed to work great. Of course, I never had time to set the buttons right so it might not have been the best of tests..
You willingly parted with you PS2? Good God man, did they drug you?! Hmmm... interesting. Since I played KotOR on my PC and got an Xbox just to play Sith Lords, I did miss many of the quicker controls that you get on the PC. Now that I have played through once (and started Halo), I ma getting used to them. I hate controllers... in fact, I hate everything about consoles. They are nothing but outright devilry aimed at making life sour for us who walk the true path of the Personal Computer!! I'm a PC gamer first and foremost, so I love a keyboard and mouse, but it'd be pretty damn stupid to use them with Ninja Gaiden. Then don't. Just cause you have it dosen't mean you have to use it all the time. Zoq: Hey, this might make these consoles worth getting. Fot: Yeah, we hate controllers for certain types of games. if the game relies on twitch gaming, then i prefer a joystick/controller. thats why i prefer playing my sports and action games on my xbox. but rpgs i like better on the computer. i just cant "twitch" fast enough on the keyboard. i end up in a panic and start pounding the wrong key. Not to mention the "Duckhunt" gun. I think the PS2 controllers are fine and the Xbox s-controllers are, too. Relax, that wasn't a knock against the converter you mentionned. It was aimed towards Kaftan. 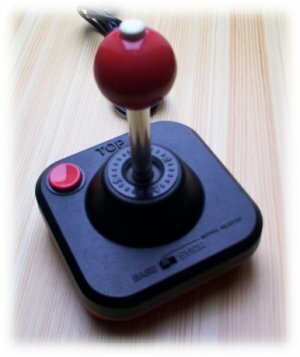 And BTW, the old Atari joysticks kicked ***. I had an old Wico Redball for my Commodore 128 that I still miss tremendously. An old swedish gaming magazine once reviewed the Wico Redball. They gave it the highest score with the motivation, "If there ever was a World War 3, the only thing that would survive would be c0ckroaches and Wico Redballs." Edit: Isn't it insane that I have to use "1337-speek" (almost) to be able to write c0ckroach?! I like keyboard/mouse for PC games, and I like controllers for console games. Games are always better on the system they're designed for. I don't mind the ps2 controller much but dammit! Those Xbox controllers are just way to bulky!